Have you been to The Living Planet Aquarium yet? SassyScoops.com recently had the opportunity to experience all the fun and education available at the Aquarium! The Living Planet Aquarium has over 1,250 animals and 267 species on display in their three main exhibits: Discover Utah, Ocean Explorer and Journey to South America. Discover Utah houses some of Utah’s threatened and endangered species such as June suckers, least chub, Columbia spotted frogs and Boreal toads. Interactive exhibits include a simulated boat ride across the Great Salt Lake where you will learn about the life cycle of brine shrimp and brine flies, how the lake impacts the economy, why birds migrate to the lake and how the lakes’ ecosystem affects our planet. Families can learn all about the importance of preserving and protecting Utah’s waterways as they explore and experience this exhibit. Ocean Explorer features saltwater species from all over the world. You’ll find sea jellies, eels, seahorses and 6 different species of sharks. Learn about why coral reefs are so important to our planet and find out the importance of invertebrates at the Bio-Facts Station. 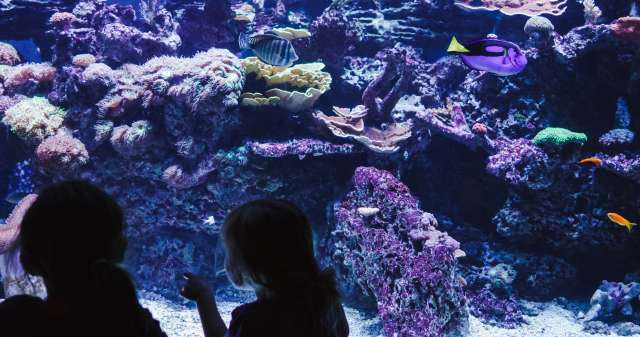 Interactive exhibits include the stingray touch tank and the coral community where the younger children can “swim” around through this magical coral reef, imagining what it would be like to be a fish at the bottom of the ocean. Journey to South America takes you through the rainforests of South America, where you will encounter 10-foot anacondas, piranha, caiman alligators, desert insects, tree boas, electric eels, tree frogs and Amazon giants. The exhibit will also educate guests about the biodiversity of rainforest ecosystems, the benefits rainforests provide us and how we all can help protect these amazing habitats! The Sassies recently went to review The Living Planet Aquarium with the Visit Salt Lake Connect Pass. You can read their full review here along with entering their contest for 4 Family Passes!